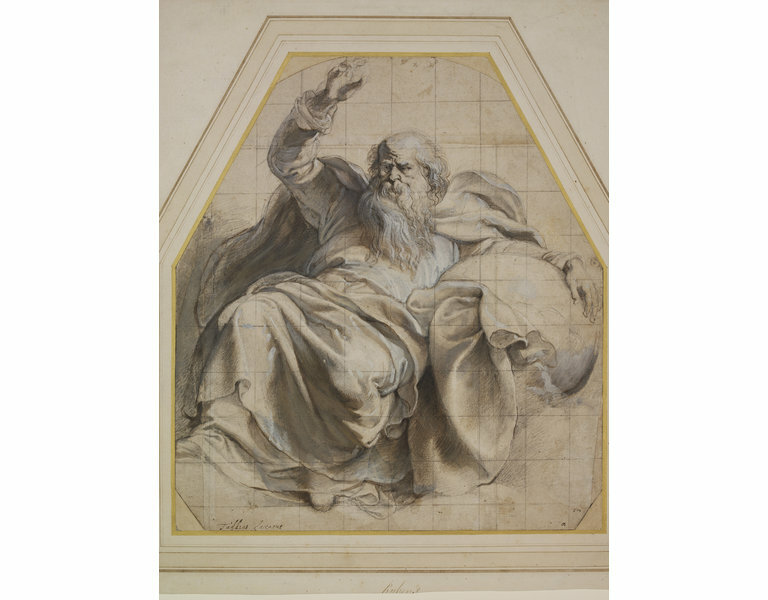 God the Father; heavily draped and reclining on clouds, and supported by the globe over which he stretches his left arm, while he raises his right hand in benediction; Black chalk and oil colour, heightened with white and ruled in for copying. The top corners cut off; Inscribed with a spurious signature, Taddius Zuccarus. ; Possibly a study for the figure of God in 'Fall of the Angels' or 'Holy Trinity' at Munich. Inscribed with a spurious signature, Taddius Zuccarus. Jan van der Does, Heer van Bergesteyn (c.1635?–1704);5 Valerius Röver (1686–1739), Delft; by descent to his wife, Cornelia Röver-van der Dussen (1689–1762); sold through Henrik de Leth, Amsterdam, on 22 January 1761, to Jonkheer Johann Goll van Franckenstein the elder (1722–85), Velsen; Charles Rogers (1711–84), London (L. 624), his sale, London, Thomas Philipe, 15ff. 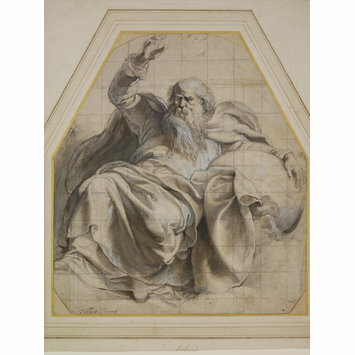 April 1799, lot 574: ‘RUBENS ... on the drawing of Taddeo Zuccaro’; Rev. Alexander Dyce (1798–1869), London (L. 711 bis), by whom bequeathed to the museum (L. Suppl. 153b), 1869. Possibly a study for the figure of God in 'Fall of the Angels' or 'Holy Trinity' at Munich. Rubens reworked around 200 drawings by other artists. Here he applied dark wash and white bodycolour to create a sense of volume and strong directional light. Rubens may have reworked drawings to challenge his inventiveness or as inspiration for his paintings. 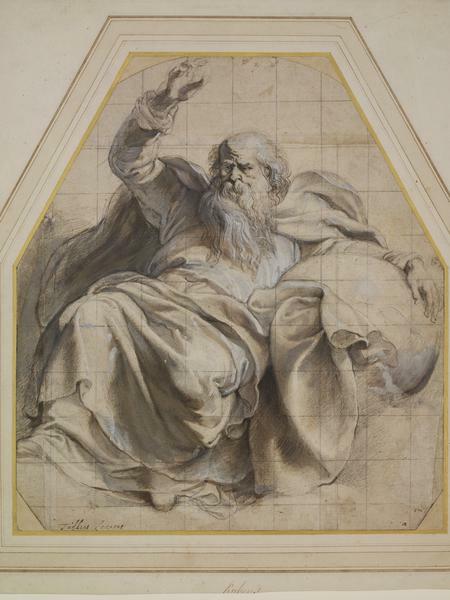 Depictions of God the Father were common in the Catholic art of the Southern Netherlands and Rubens included similar figures in several of his paintings.